I've got no word else to describe my skin but dry. Sensitivity, dry patch, scaling and peeling, and tightness — name it and I'm certain I've been there, done that. For the most part, it could get totally tedious, considering that moisturizing is the bane of my everyday existence. Imagine if the five to eight minutes I have allotted for applying these moisturizing agents, layer after layer, to my skin everyday is simply added to my good night's sleep, there'd be one less chaotic bedroom in the world every morning; one less furious driver because he wouldn't be let waiting for an extra two minutes for his passenger and also not to miss, one (or two) less phone alarms that have been ringing in vain, or only to be snoozed. Looking at the bright side however, if you'd come to think of dryness as the sole problem of your skin, solution wouldn't be a 10-step skincare routine like that of Koreans, and in fact, can be broken down to two simple steps: 1) chug at least eight glasses of water (I swear this isn't drivel and it actually works! 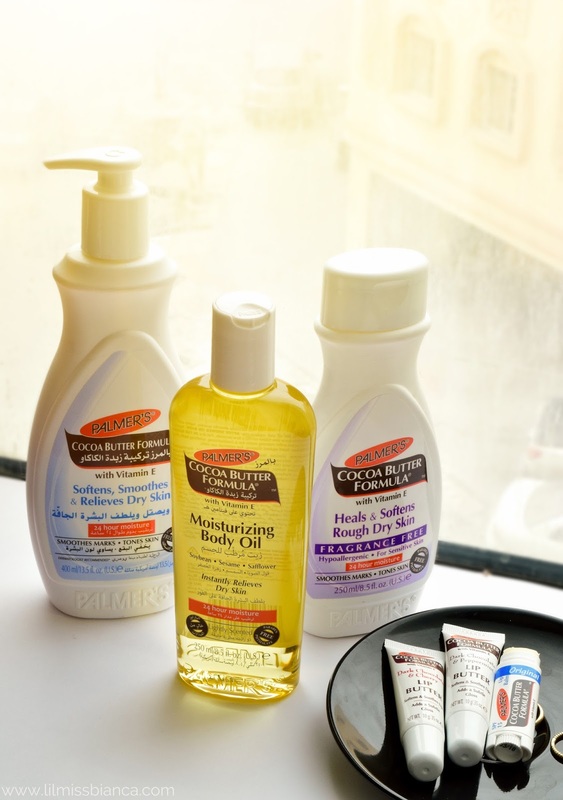 ), 2) find moisturizing products that actually work, but this step doesn't come easy at all. Scent-wise, it's a do or die. Every single drugstore lotion I've tried comes with the generic lotion-y scent, and I try to shy away from them because quite honestly, life is too short to smell like a generic body lotion everyday. So for me, a great daily body moisturizer is either fragrance free or comes with the scent I actually like. 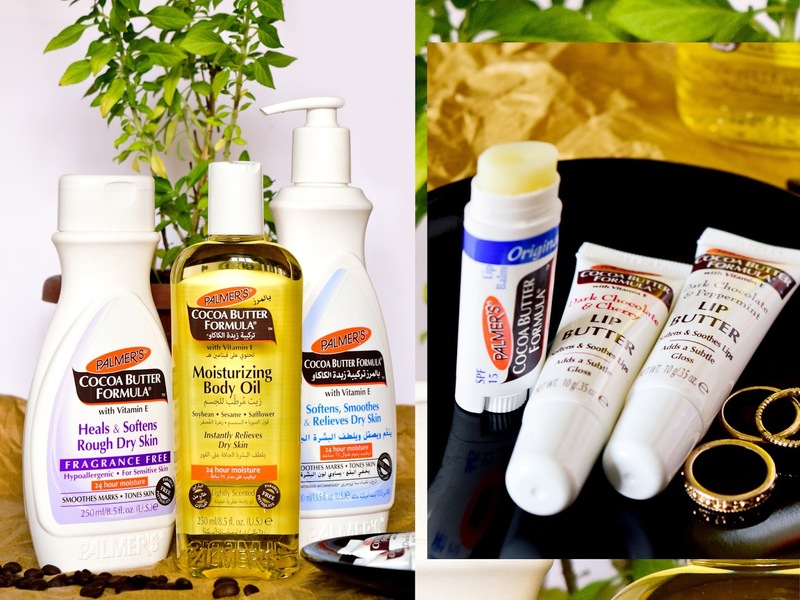 Enter Palmer's Cocoa Butter Formula line, which has a whatchamacallit for someone who prefers scentless moisturizers (Fragrance Free Lotion, 8.5 fl.oz., QAR 21) and for someone (me included!) who enjoys sweet and such chocolatey scent. Nutrient-dense. It may sound like a quality one would be looking for in a matcha tea, but for me, whenever a particular skincare product comes with vitamins and antioxidants, there's an assurance made that its effect is not merely skin-deep, and thus, has a longer lasting result. As we all know, makeup is skin-deep. But skincare products are not meant to be the same. However much to my disappointment, most of the lotions I have used tend to moisturize my skin only on the surface and be washed away in the shower just like how my foundation would literally be swept away when I wash my face. And that, my friend, is exactly why I love Palmer's Cocoa Butter Formula Moisturizing Body Oil; after shower and when my skin is slightly damp, I apply it all over my body. I swear it smells so good you'd crave a choco fudge cake after the entire application. Also, it reveals a soft, smooth skin even after you shower and cleanse your skin the next day. 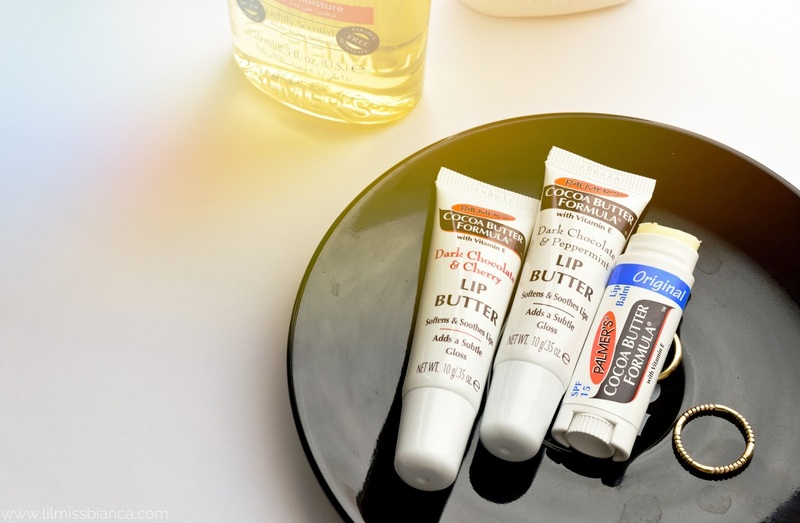 Aside from body moisturizers, Palmer's Cocoa Butter Formula line also has something for the lips, which are the part of the human face that is easiest to get dry. Just by looking at your lips, you would instantly know how much more water you should be consuming. If chapped, drink a gallon more or simply apply these little babies on your lips. Disclaimer: The products mentioned in this post were provided by Palmer's. The opinions expressed herein are 100% mine and are not indicative of the opinions/ positions of Palmer's.